Today, we honor the CCC boys and their legacy. 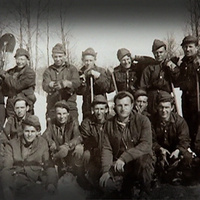 Join us for a day of fun and interesting activities: Meet the CCC boys, have some cake and coffee while enjoying music by Tom Callinan, CCC singer/songwriter, take in a lecture and buy a book to be signed by the author, play our local history trivia contest (all participants earn a "Hiram Frisbee", with the winner taking home a signed book, "Images of America, Promised Land State Park"! ), visit the museum and view artifacts not normally on display and take in a blacksmith demonstration. Local Historic Societies will be present to share their knowledge and will have books on local history for sale. GPS tours of local historic attractions will be available. Roadside Bistro will have food for sale. This event is FREE! Plenty of free parking. My brother is coming with me also in August. Looking forward to it! Thank you for remembering the CCC workers! Hope to be there this year. My Dad was a CCC boy - quit high school to work there to help his family during the depression.